When it comes to puzzles, all of you must have played the type of game where there are certain pieces mixed up and you have to put the right pieces on right positions. Sometimes, the pieces are a part of a picture while sometimes you have to construct a block in a confined space. 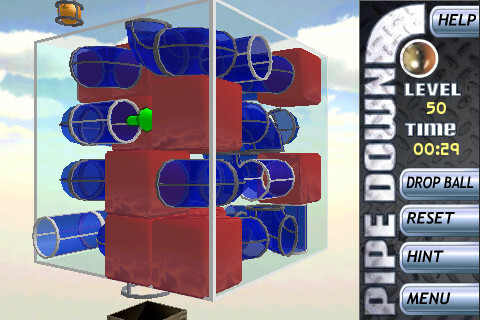 But as the title suggests, this is something different related to pipes. So, be ready to do some plumbing. 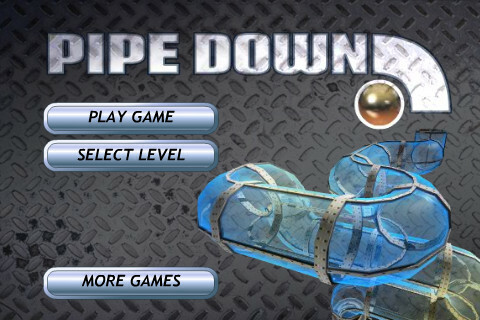 Pipedown is a new game, developed by Catalyst Pictures, who have just created a piece of entertainment. 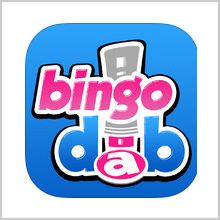 The game is compatible with all IOS devices including I Phone, iPod touch, and I Pad and requires IOS 3.1.3 or later. The plot is simple. 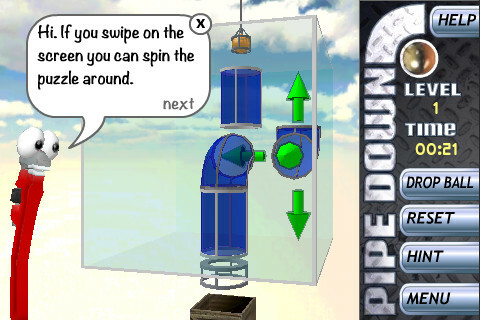 You are a plumber and have to guide a ball through a pipe from the top to the bottom. But the pipe is cut into pieces and your job is to slide them in the right direction and make them connect correctly. 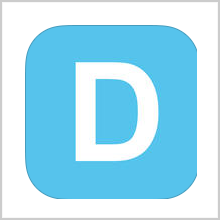 It is a 3-D game, so as you swipe the screen, you can spin the puzzle around and view the same joint from different angles because a section which might appear to you to be correctly aligned from one direction, will be horizontally misaligned actually. So, the 3-D element is very effectively used and not a forced concept, as we might get to see in many of the other games. 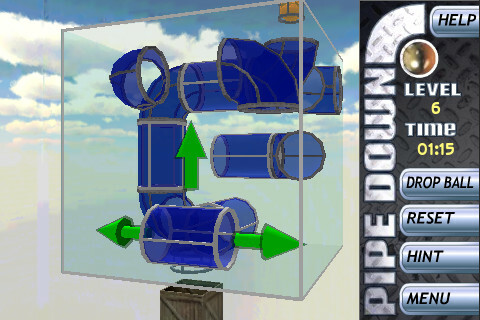 There are green directional arrows with each joint and help you to move the pipe section in a particular direction. If you think you have made all the connections correctly, just tap “drop the ball” from side menu and you have completed the level. The graphics are very rich colored and the swipe motion works perfect when viewed from different angles. Also, the sounds match perfect to the conditions and if it is concerned to me, I don’t like much sounds in between that kind of classic puzzle. However, the game is a little heavy on your memory card and sometimes, crashes in between which needs to be sorted out soon in the upgraded version. There are 50 levels designed with sheer intelligence. The first few are comparatively easy but as you cross about 15, you will start feeling the heat. In fact, in the later levels it’s difficult to properly analyze the sections from different angles as there come blocks in between to restrict viewing. Hints are also available but are free only for first 10 levels. After that, you have to buy both the levels and the hints to carry on. Overall, the game is very interesting and intelligently designed. 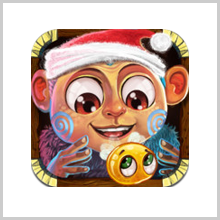 It gives you some fascinating graphics to look upon as well as brilliant game play to keep you engaged all the day. The first 10 levels are just an exhibition and you certainly should buy the remaining levels and try your hands on. Just a little complaint about those crashing reports in between; otherwise it is a sure shot. We will give this interesting game 4 out of 5 stars.